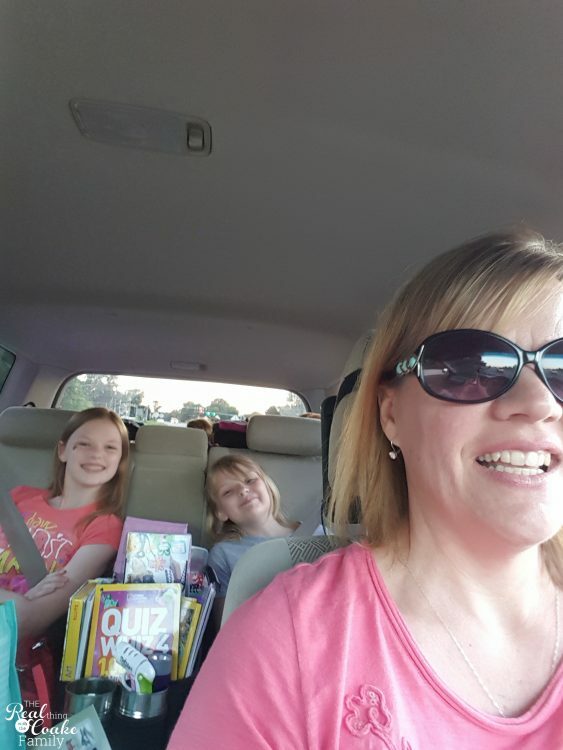 Our 2015 Family Road Trip - The Final Week! You are here: Home / Holidays & Special Days / Seasons / Our 2015 Family Road Trip – The Final Week! 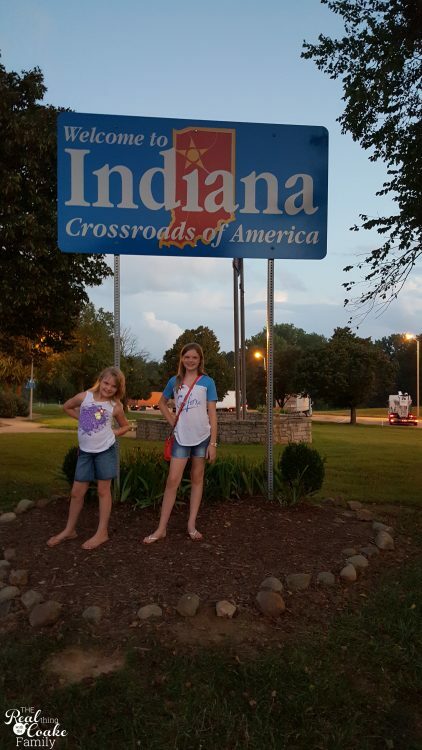 Our 2015 Family Road Trip – The Final Week! 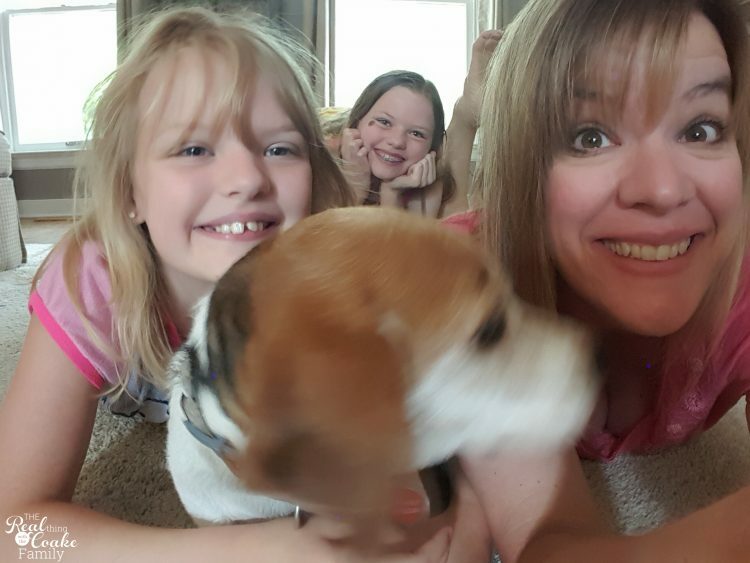 If you have tuned in for all the other posts about our summer 2015 family road trip, then you may be sad to see that this is the last post in this series. While I'm sad to finally be writing about the last of our journey, I don't think the three of us were sad to see the end of our road trip. While we had a great time, it was about this point that we were realizing that this trip was a week too long. We were tired and tired of driving, despite still finding fun along the way. This week, we covered a lot of ground and managed to find some fun despite being tired…so very tired. We also became hotel snobs at this point. We had two bad hotel experiences along our journey. One happened at one of the hotels in the week I wrote about in the last road trip post and the other happened this week. I became much pickier about our hotels at this point, not that I had been selecting bad or bad quality hotels, but after this long on the road and two bad experiences, we all really began to care. Anyway, let me show you all the sights we saw in our last few days on the road. 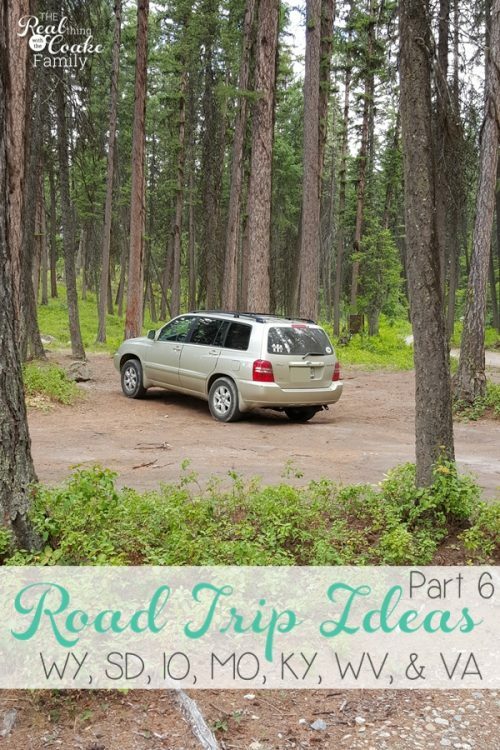 After the amazing drive through Yellowstone and Bluetooth highway and staying at an amazing hotel we never wanted to leave, we headed out toward South Dakota. 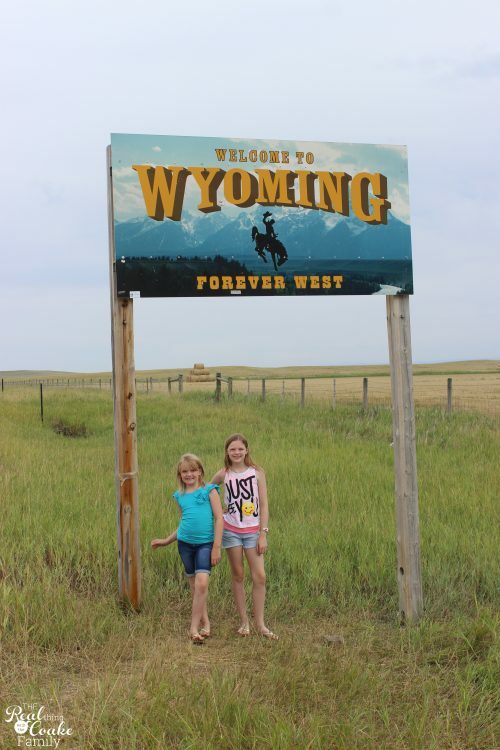 We passed through Wyoming…again. Pumpkin, my youngest daughter, had requested that we visit Mount Rushmore. It was not too far off our route, so it was added to the itinerary. We tend to be late travelers. Thank goodness we made it before dark. It would have been perfect timing for gorgeous sunset views had it not been overcast. 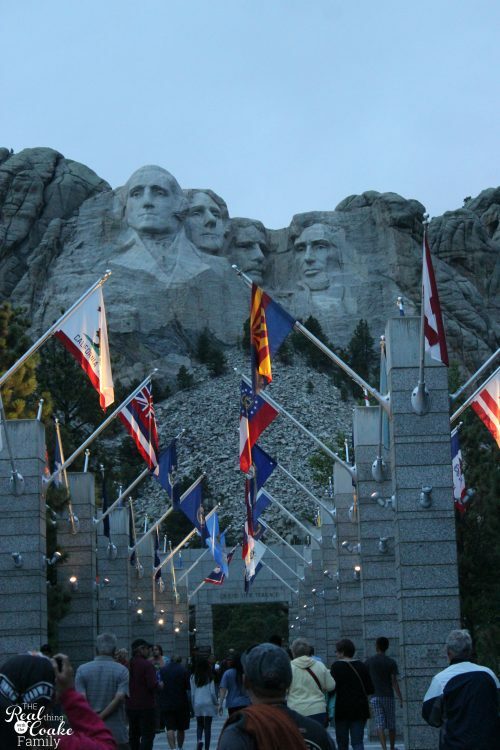 Now if you are not familiar with the area, Mount Rushmore is near Rapid City, SD. Which is near Sturgis, SD. 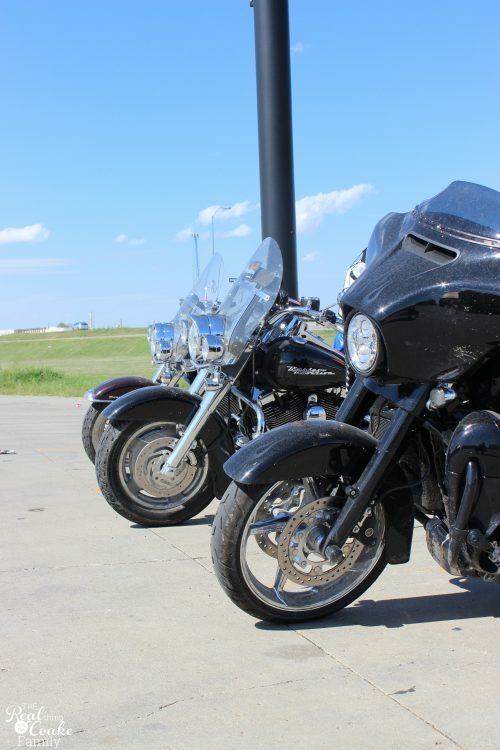 Sturgis is home to an annual motorcycle rally. This year was the 75th anniversary of the Sturgis Bike Rally. Yep, you guessed it, I timed our visit so we were there during the Bike Rally. 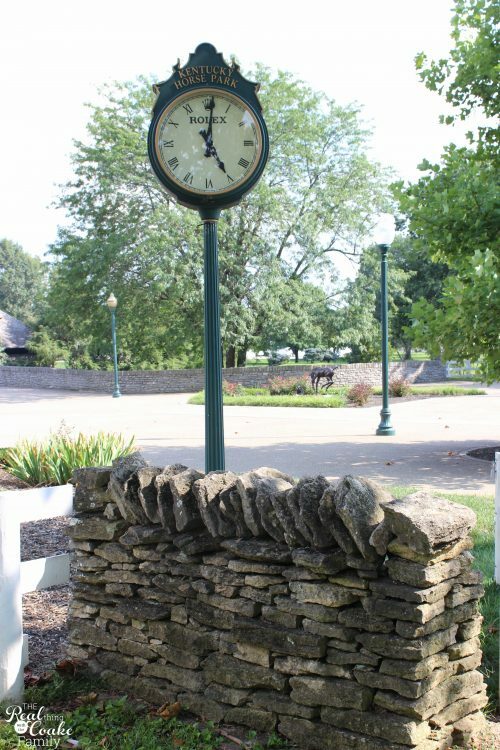 No, I didn't really purposefully time it that way, it is just when our dates fell. It was really hard to find a hotel room, but Pumpkin really wanted to see Mount Rushmore, so I kept looking and finally found one for a somewhat reasonable price. I'll get back to this again, but if you have never been to Sturgis during the bike rally, you can't even begin to imagine the number of motorcycles you will see. Everywhere. I heard there were half a million motorcyclists there this year. It was crazy the number of motorcycles we saw as well as how many were on the road. Never seen or heard anything like that in my life. The noise…oh the noise. 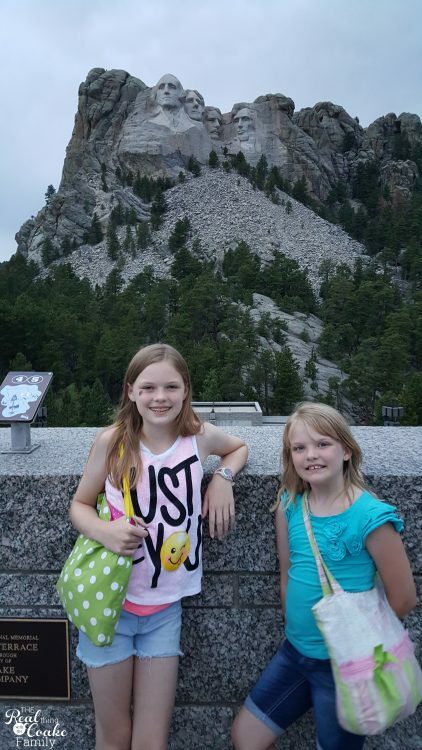 Anyway, we arrived at Mount Rushmore near sunset and the girls quickly set to earning their Jr. Ranger Badge. 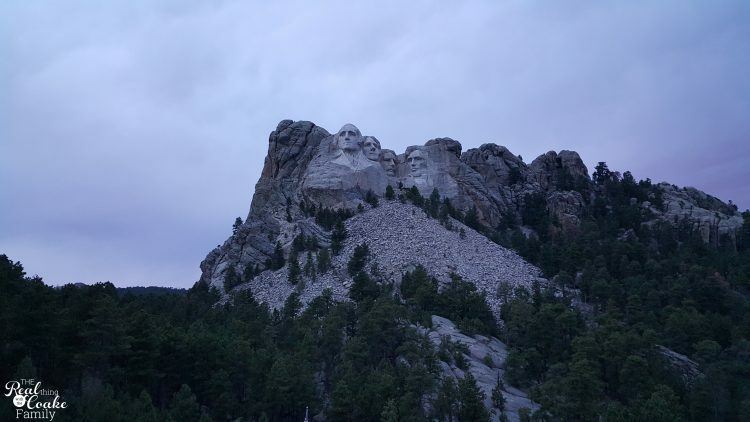 There isn't a lot to do at Mount Rushmore. There is a huge gift shop as well as a museum and some kind of a walk you can take. Unfortunately, the Jr. Ranger badge took a little longer than we anticipated because of a chatty ranger, so we didn't have time to take the walk. Boo! I was determined to make it to our hotel before 9 pm one night. Not sure we made it that night, but I tried hard. Pumpkin was so glad she got to see Mount Rushmore. I'm so glad I could give her something she really wanted. That night at the hotel, it was a nice, brand new hotel(remember we had become hotel snobs), the noise of the Sturgis bike rally never ended. I think people may think I mean, partying. Nope. We didn't hear or see anything like that. 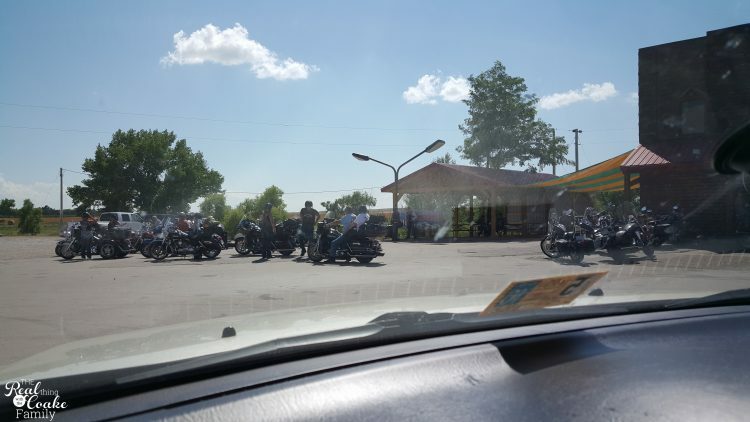 When we pulled into the hotel there were rows and rows of motorcycles. 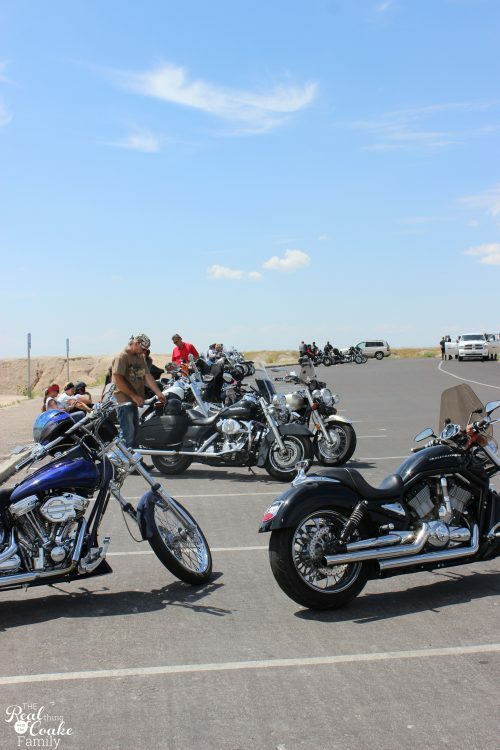 The Sturgis Rally draws a lot of Harley Davidson motorcycle fans. Their motorcycles tend to be loud. I always set the hotel a/c with the fan to run constantly as it helps drown out outside noise and any hotel noise. Despite being on the 3rd floor and using my a/c fan trick, I heard motorcycles ALL NIGHT long. It made me a little nervous to be on the road with so many motorcycles, but I needn't have been. They usually were in groups together and easy to spot. They were also law-abiding. Everyone we meet was very nice. It sure added to the memory of our trip. The following day, we were headed to Sioux City, Iowa. 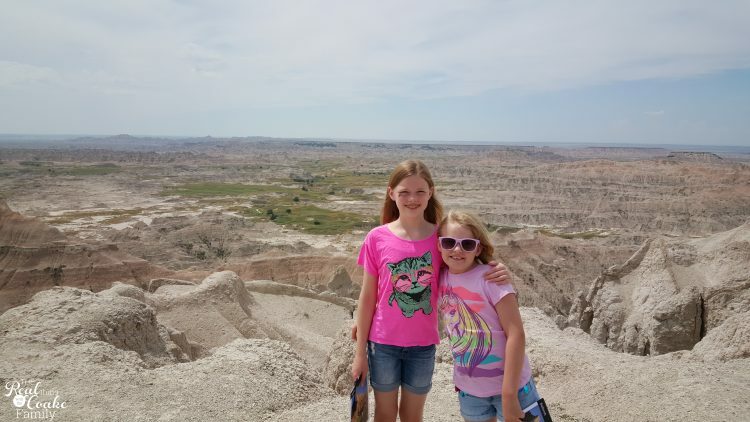 We really wanted to see The Badlands. Kind of like Yellowstone was a little bit of a disappointment, The Badlands were a bit of a disappointment. Theodore Roosevelt National Park and driving Beartooth Highway were just that great. 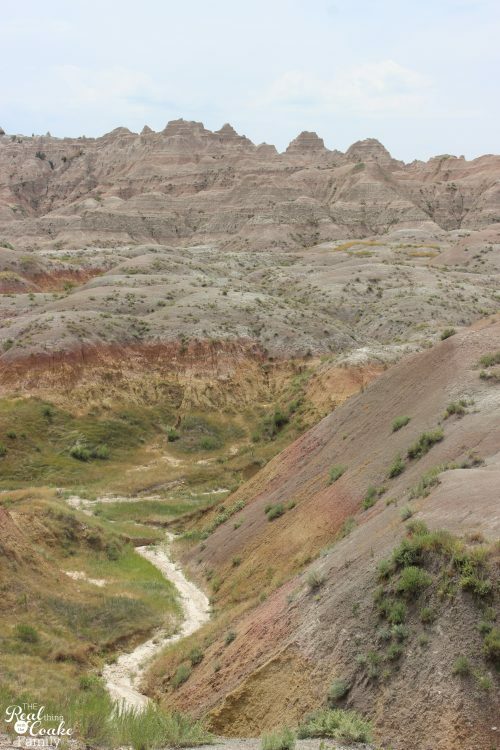 The Badlands are amazingly gorgeous. 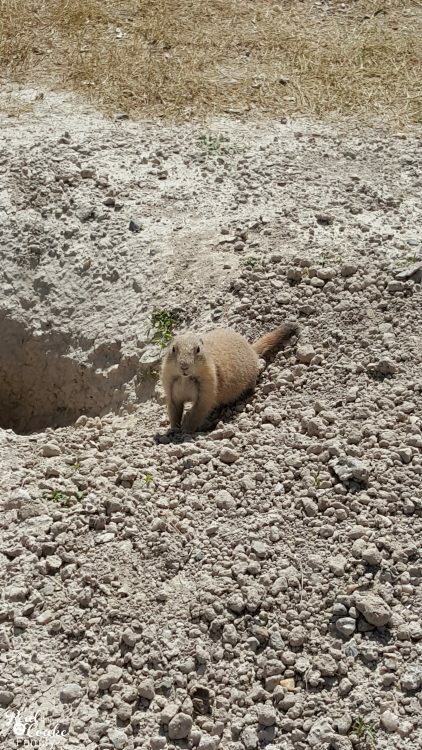 They are also quite surprising because you are driving in what seems like totally flat prairie land and bam…there are the badlands off to one side. You just don't see things like this every day. 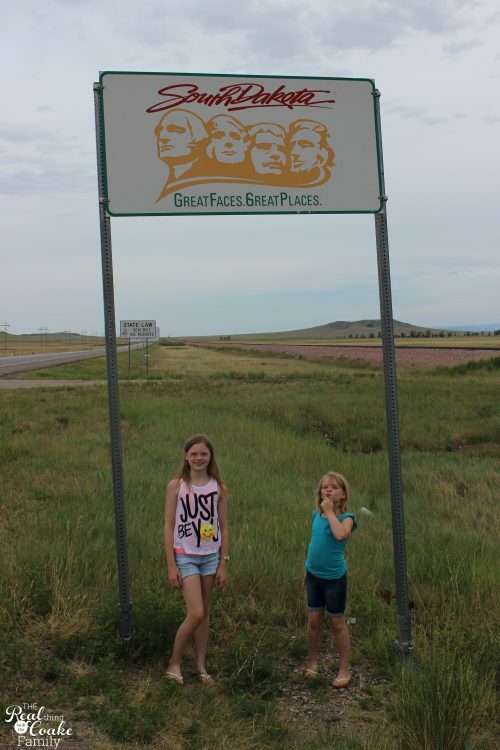 I think one of the reasons we found them a little disappointing is that it is mainly just a drive through kind of National park. There weren't many places to wander and hike around. 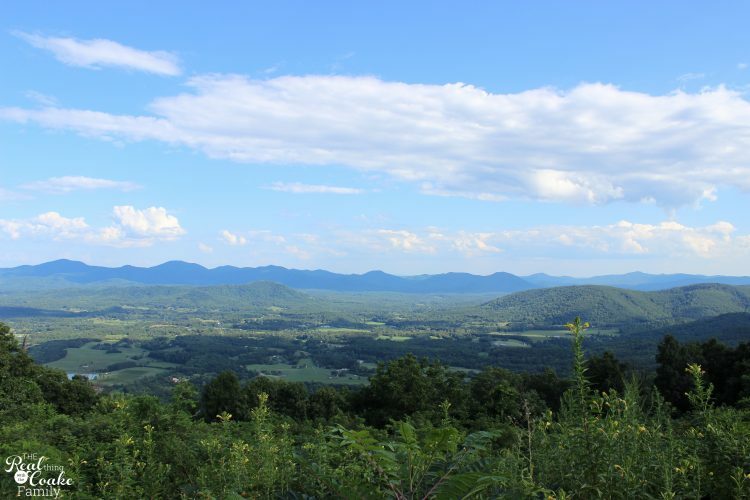 There are plenty of overlook spots, but not much to get into the area…unless we missed it. It was also really hot and there was very little wildlife that we saw. For us, it just made it a little disappointing. Remember how I mentioned that this is near the Sturgis Bike Rally? 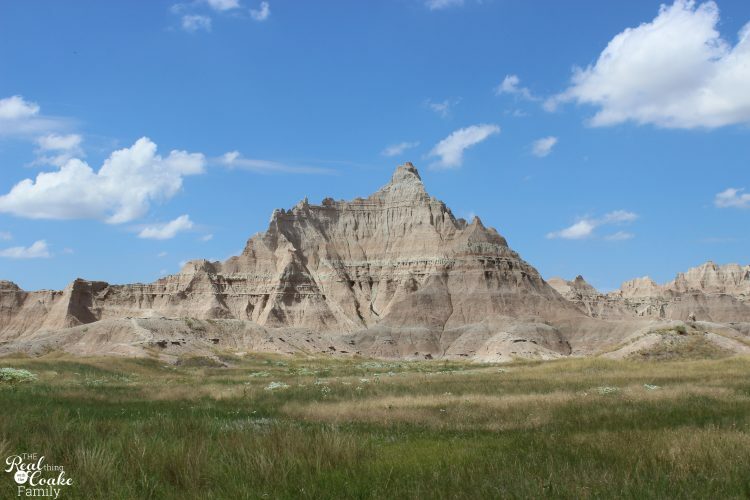 This is what our drive through The Badlands National Park looked like. I've never seen so many motorcycles in my life. It was amazing…almost like another of the sights we were seeing on our trip. Every lookout or scenic point parking lot looked like this. Usually with even more motorcycles. I just felt a little weird about taking a picture of all the motorcycles. I would have loved to have one with the big line of motorcycles in this little downtown area near Mount Rushmore or at our hotel. It just felt weird to me. 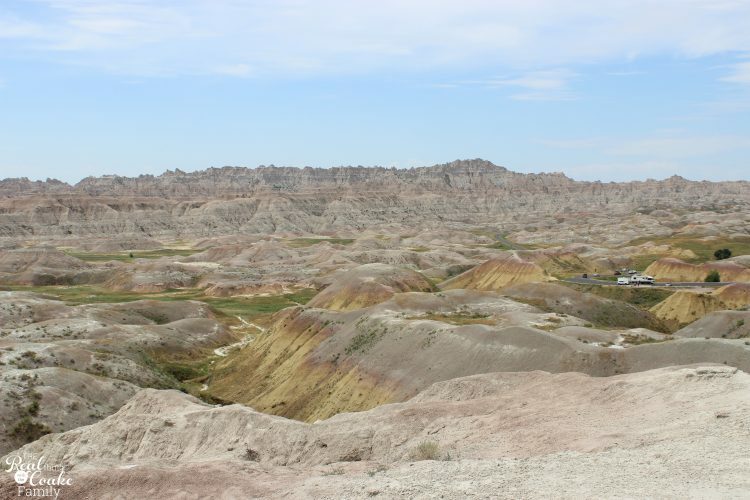 Anyway, The Badlands are an amazing place, they just didn't turn out to be a favorite of ours on our journey. 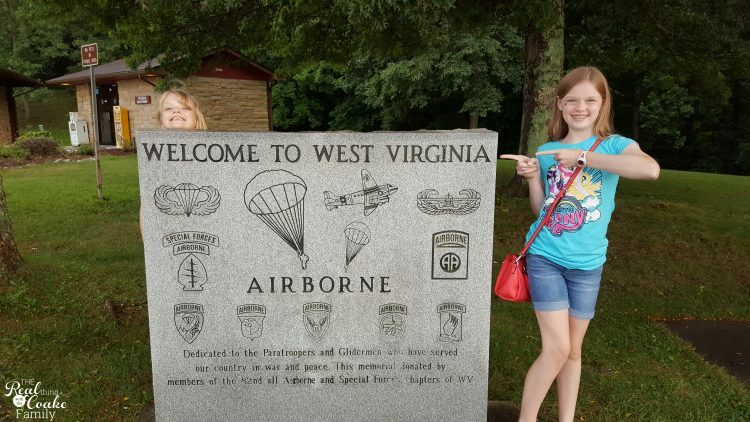 My girls did earn yet another Jr. Ranger badge here though. Sure wish we had gotten a National Park passport at the beginning of our summer. It would have been neat to see exactly how many stamps we got this summer. 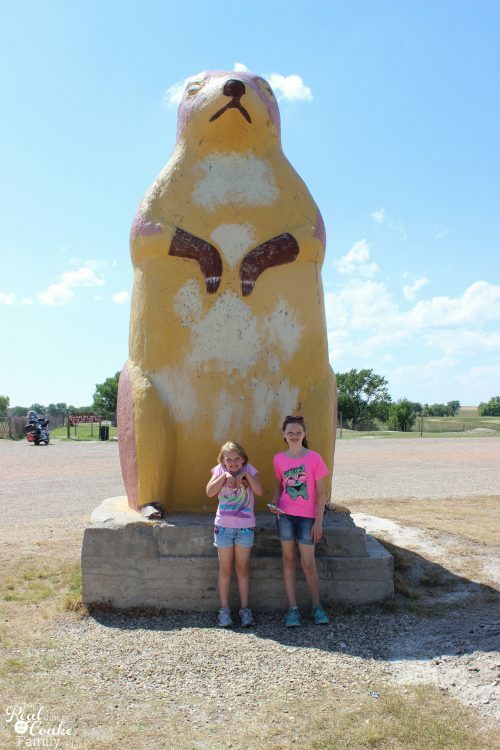 Near the exit we took from The Badlands National Park, we found this prairie dog statue. 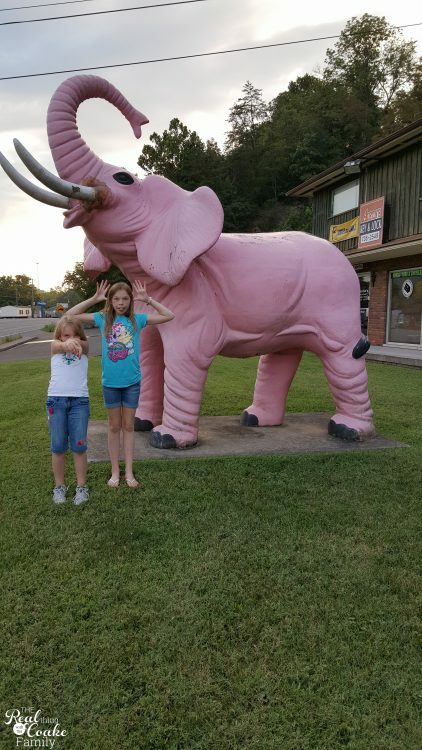 Since we love a good roadside statue…we had to get out and take pics with it. 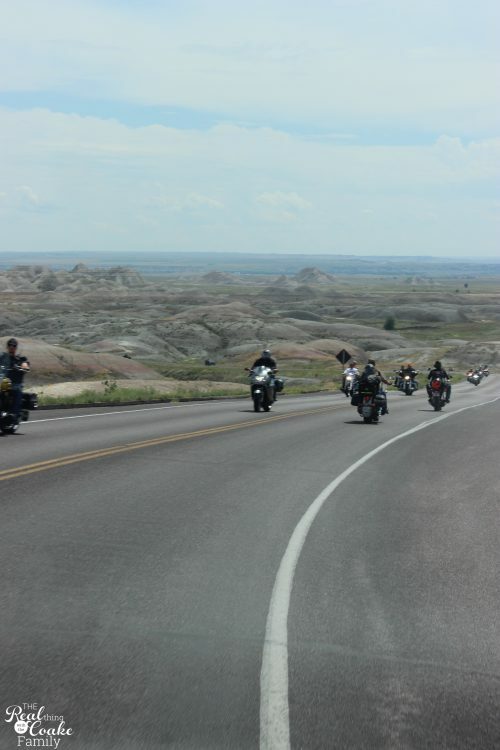 Even miles away from Sturgis, motorcycles were everywhere. For hundreds of miles in both directions, we drove with motorcycles. I finally got brave and snapped a pic of a small row of motorcycles. Of course, one of the owners came out and was staring at me a bit funny. Ha ha…just wanted a pic of all the motorcycles. Hope you don't mind. lol! Awkward! That day we ended in Sioux City, Iowa…the now famous “Complimentary upgrade” hotel. Geesh…Now we are hotel snobs FOR SURE! 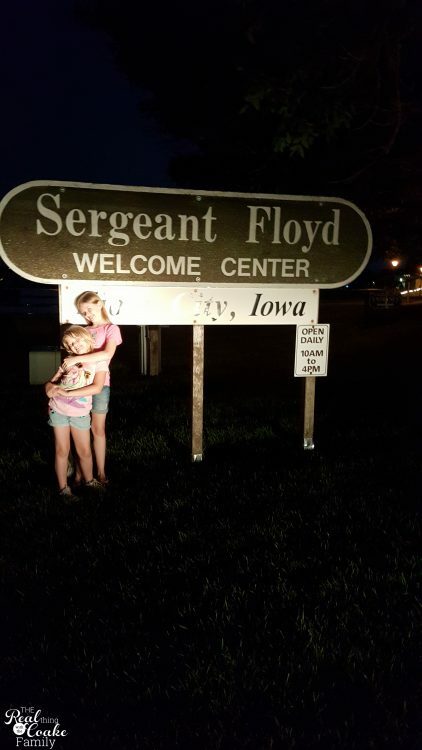 We couldn't find a welcome sign, so we used this sign with my car headlights on the girls to be able to take a pic in the dark. 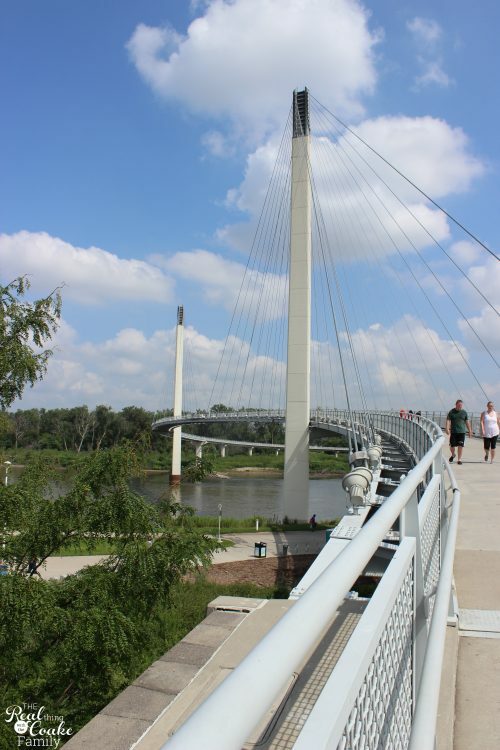 I found, on Roadtrippers, this cool bridge that we could walk from Iowa into Nebraska…then we can mark yet another state off our list. 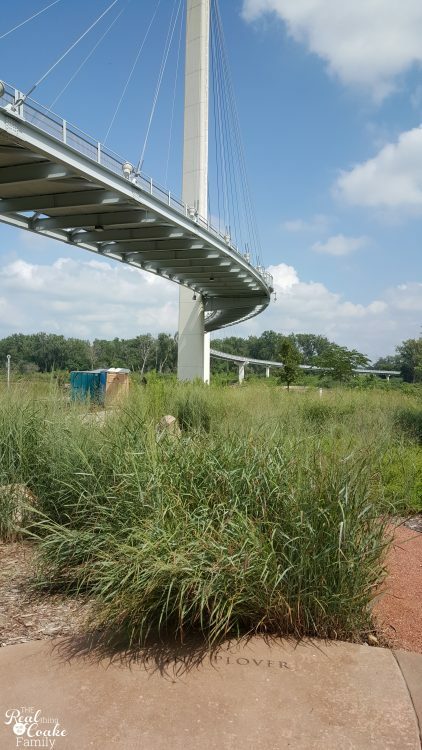 For some reason Google maps navigated me to the Nebraska side of the bridge, so we ended up walking from Nebraska into Iowa. It is about a 1-mile walk round trip, which we love getting out and being active. It was, however, very hot and very humid. Not the best combo for a 1-mile walk in the middle of the day. Blech. I never knew that Nebraska and Iowa were so stinking humid. It was disgusting. 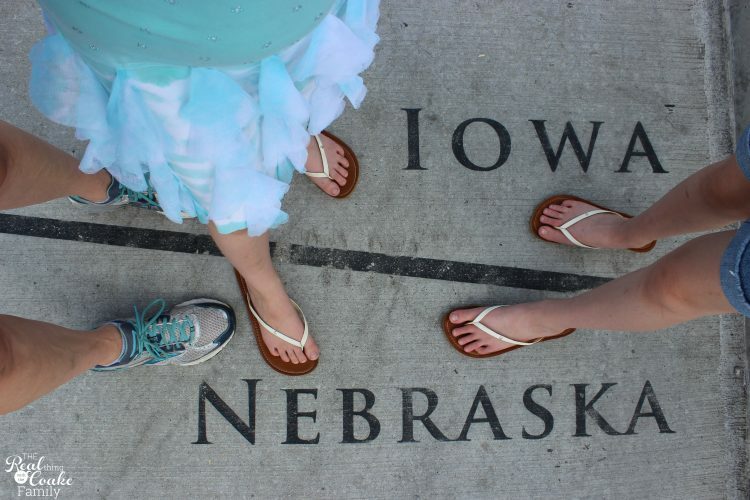 The neat thing about this bridge is that they have the state lines marked on it, so you can stand in two states at one time. All three of us are in two states at the same time. 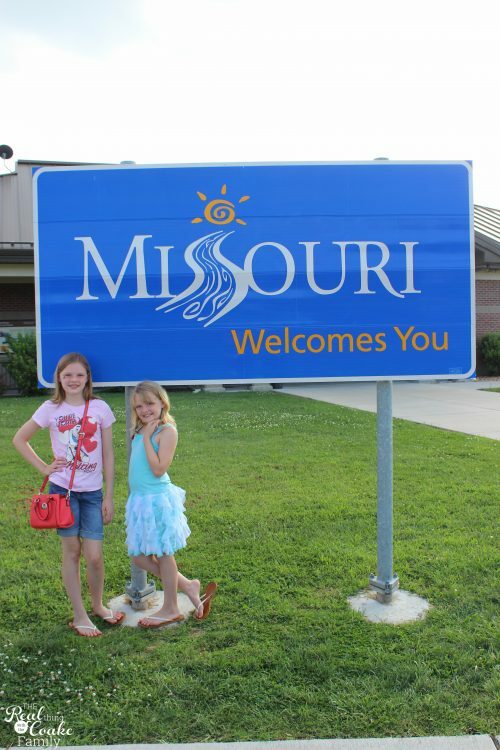 We made it to Missouri the following day. 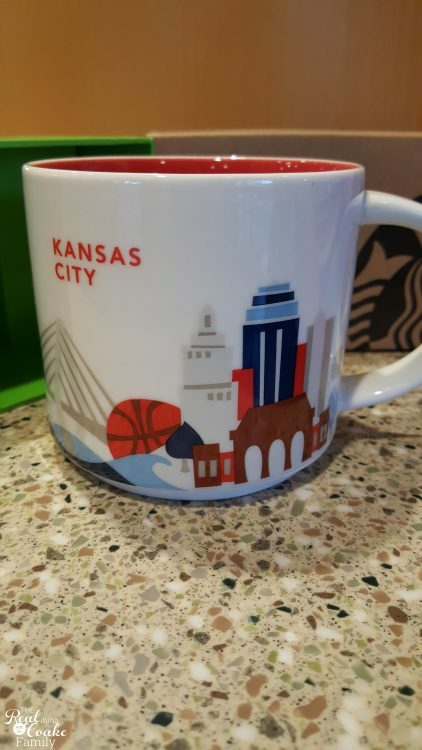 I finally got another mug for my collection. This time for Kansas City. We were only on the Missouri side of Kansas City. Had we made it through during daytime, we would have stopped at the Kansas City AG store, but we were going through on a Sunday and it closed early. Sunday's turn out to be hard days to find things to do because lots of things are closed or close early, at least in this part of the country. 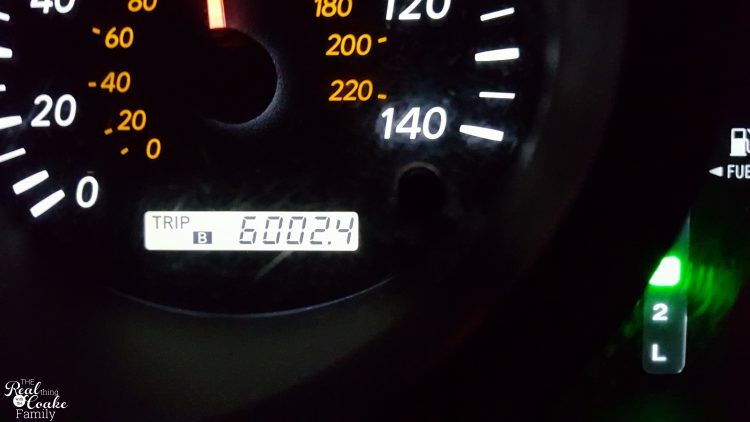 We have hit 6,000 miles driven! Oh la la…that is a lot of driving. 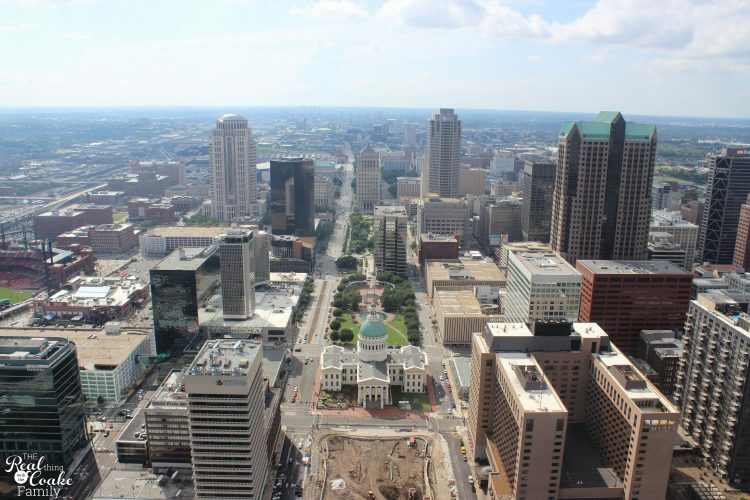 The next day, we made it to St. Louis, Mo. 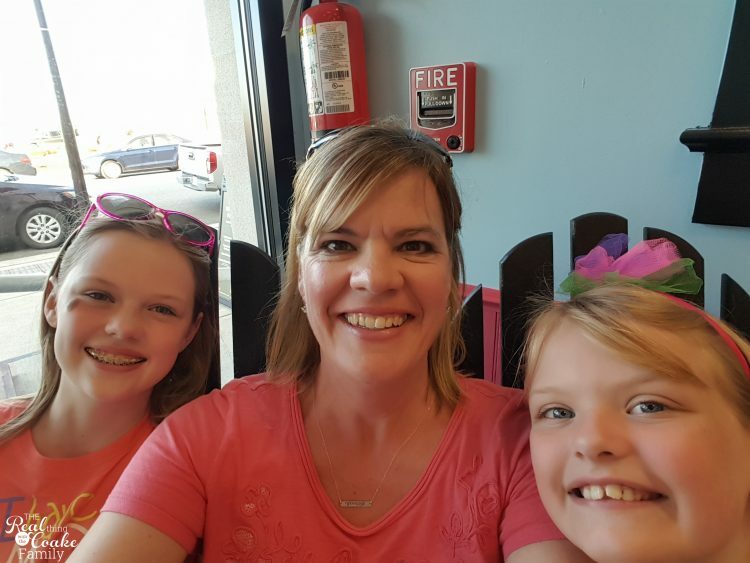 My girls really wanted to see another AG store, so we spent 1 hour at the St. Louis AG store. I loved these pretty flower pots they had outside the Bistro (though I think it was so small it wasn't an official bistro). 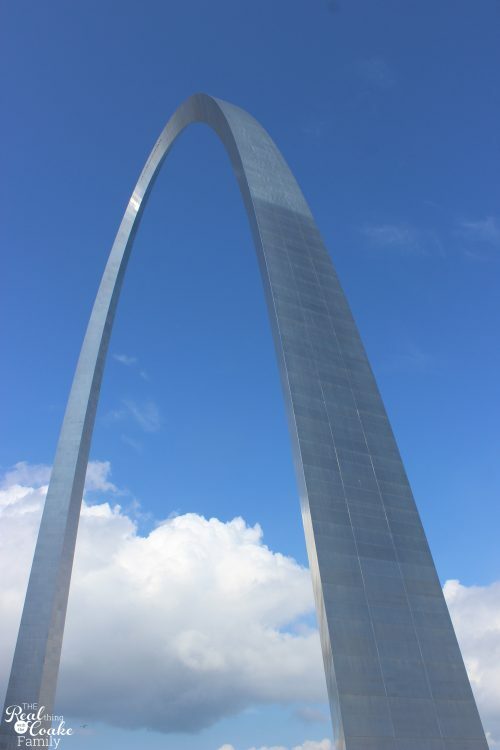 Then it was time to see the St. Louis Arch. 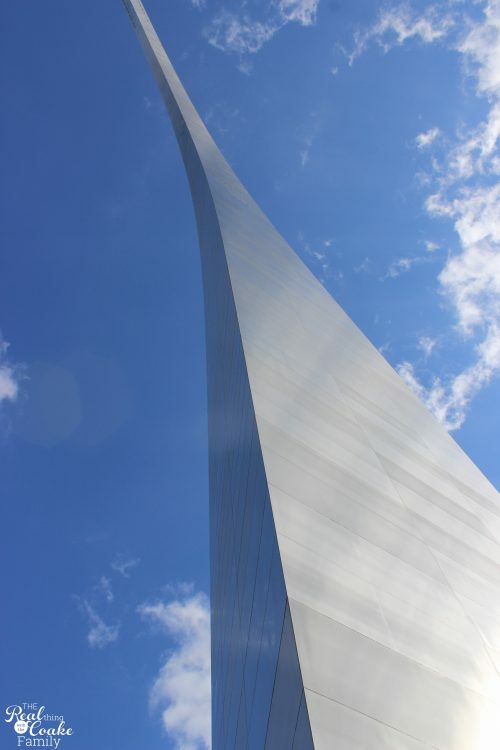 The whole area of the arch is currently under construction. It was a bit of a mess to find and get to. I was trying to pay attention to something on my phone and didn't see a curb down. I fell so hard down on the concrete. 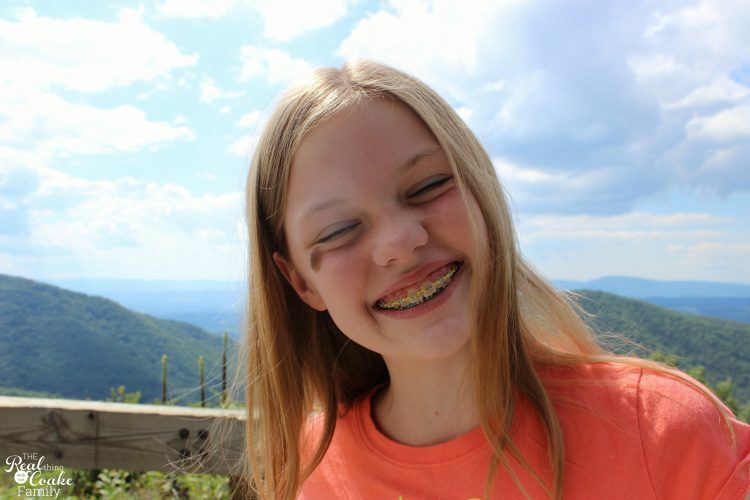 It was so embarrassing and I alos feel like I'm so lucky I didn't break an arm or something with how hard I went down. You can get some perspective here. 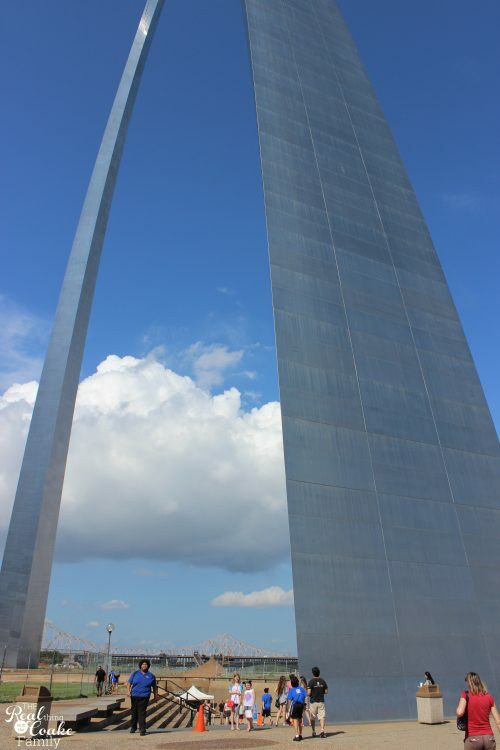 You can see my girls standing at the base of the arch. It is 600+ feet tall. 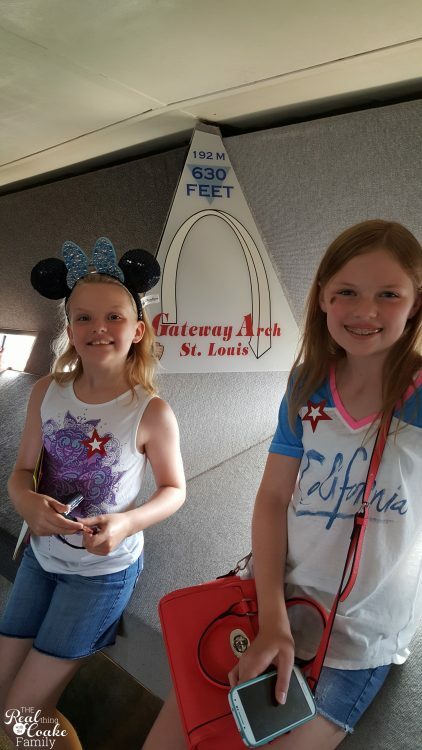 We did pay to ride up to the top of the arch. I'm most often asked about what the elevator is like that you ride up to the top. It is small. 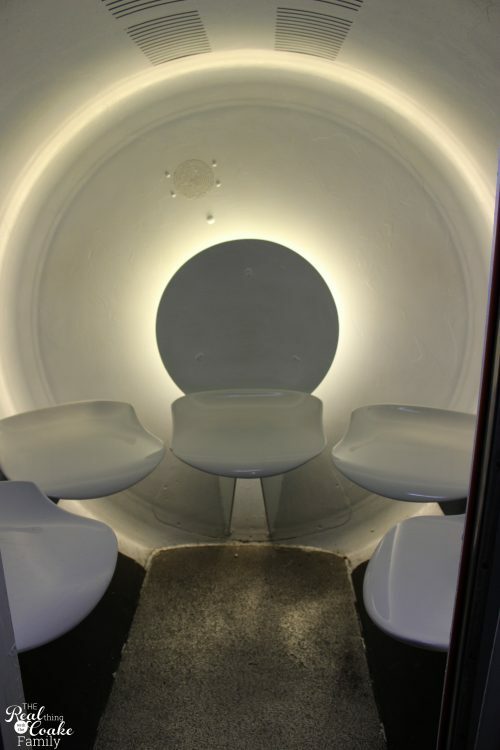 It does have glass doors, so it makes it feel a little bit better at the enclosed space. 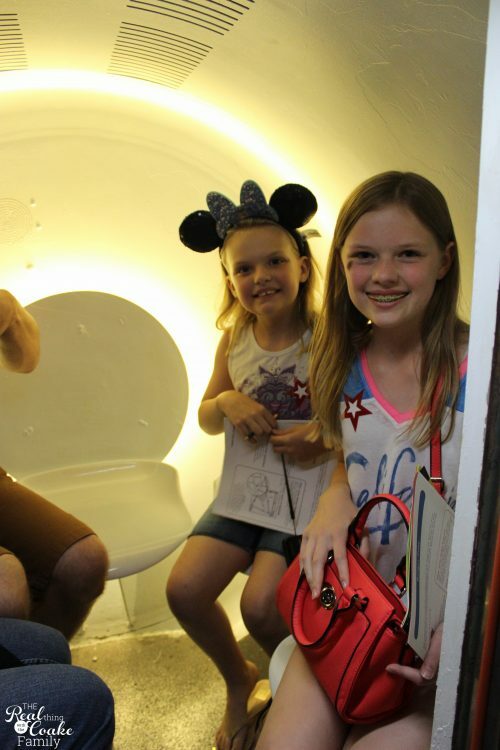 I think if the doors were a solid material, I would not have enjoyed this ride. It is a cozy little ride, but pretty cool. I would love to know how they ever thought of the way this elevator works. We aren't super fans of heights, despite our trips to the Willis Tower and Space Needle seem to indicate. The arch was our least favorite. It was high up and narrow and very pitched to walk around. It is a little freaky to look out and down from the top. Someone I talked to mentioned that they could feel it swaying in the breeze when they visited. Super glad we couldn't feel that the day we were there. The views are neat and we are really glad we did it. Our motto when we are on a trip is pretty much, we might as well do it because who knows when we will be here again. For that reason, we were glad we went. As I said, it wasn't a favorite. 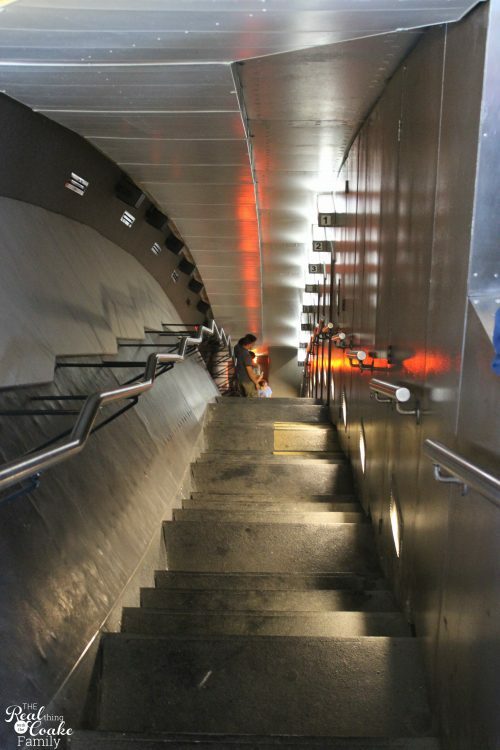 These are the narrow and steep set of stairs at the top of the arch. The people there are waiting to get in the elevator pods to go down. 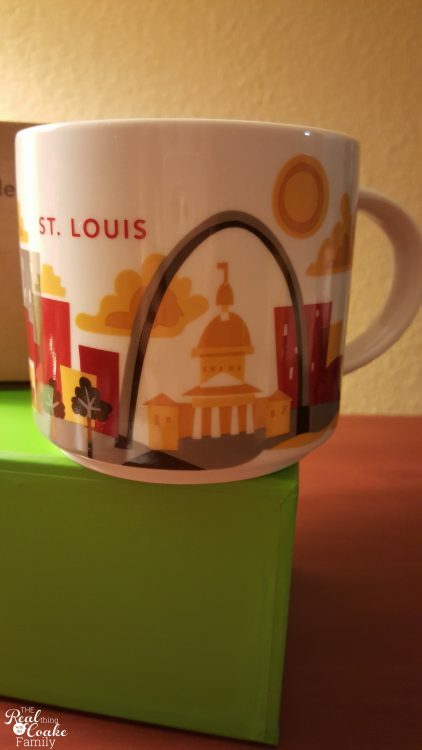 I got my St. Louis mug! Next up, we ordered some St. Louis style pizza and ate that in the car as we headed back out on the road. 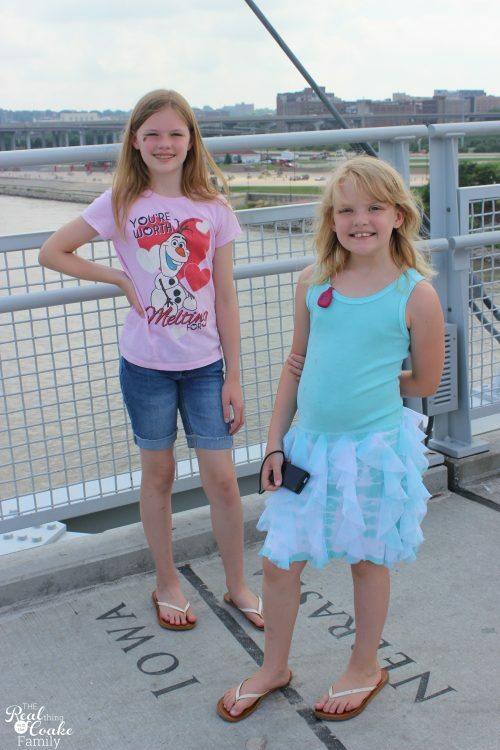 We made it through Indiana and Illinois and into Kentucky that day. We are VERY slowly getting moving in Kentucky today…breakfast at 2pm is totally normal, right? Only 2 more days of driving. Yay! So, I know this might be the dorky section of this post, but when you have been on the road for 5.5 weeks, a delicious breakfast of fresh food becomes kind of non-existent. I found my Kentucky mug and was looking through Foursquare to find ideas for breakfast (because we had missed yet another hotel breakfast). I saw they had a First Watch in Louisville and knew we had to give it a go. Oh my yum! 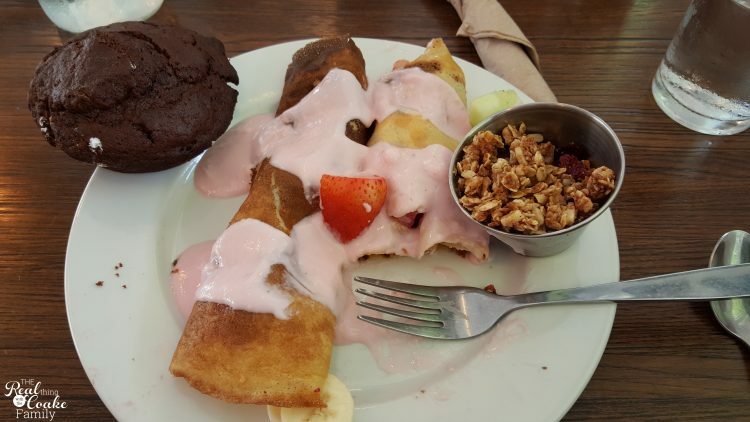 Fresh fruit crepes are so amazing when you are craving a healthy meal. All three of us ate them. They were just what we needed as we were feeling tired and road worn. 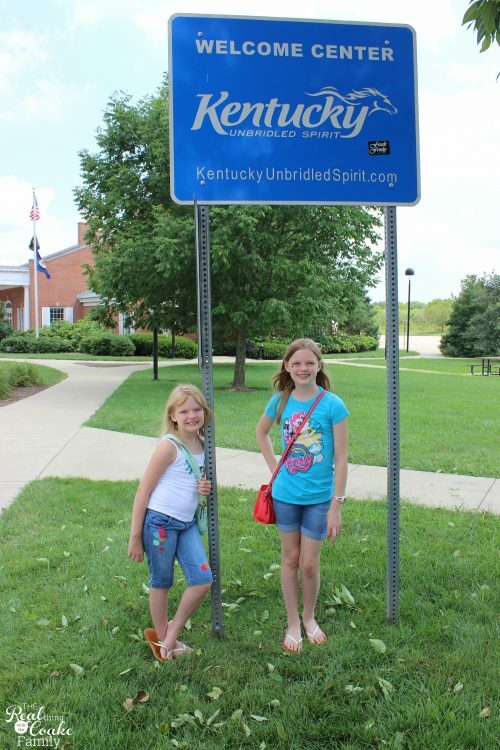 The Kentucky welcome center is actually on the other side of Louisville when traveling East. We managed to take a quick break for pics. We were trying to find something to do on our trip this day. 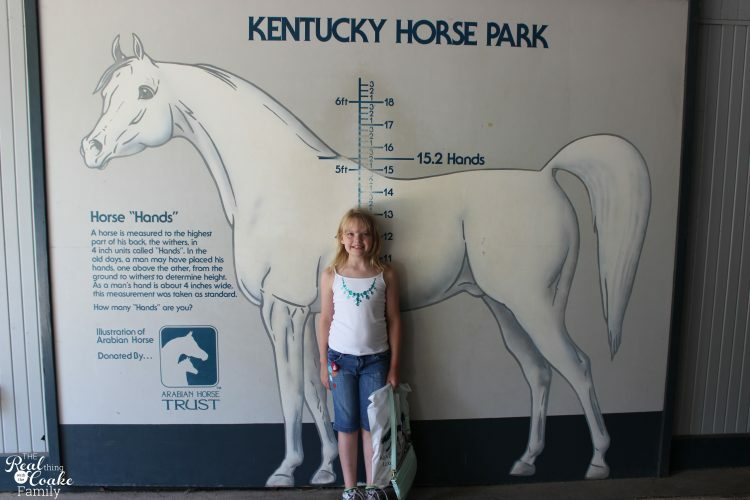 My youngest daughter loves horses and had really wanted to go to the Kentucky Horse Park. It seemed kind of expensive for a quick visit, so I was going to skip it, but then I debated more and wound up going with my motto, Why not do it because we are here and who knows when we will be here again. Do you think she liked Mommy's decision? Totally! We did get there at around 4 in the afternoon. They close at 5. 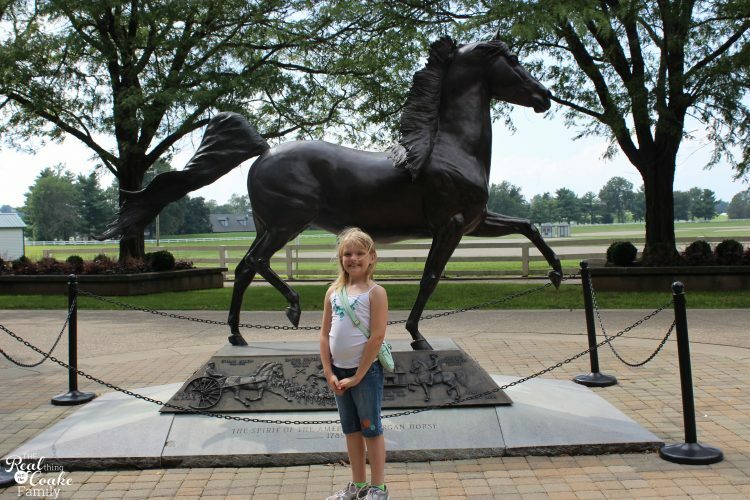 She wanted to spend some time in the gift shop, then we wandered the grounds a bit. Turns out you don't have to pay to enter the park when you get there that late in the day. 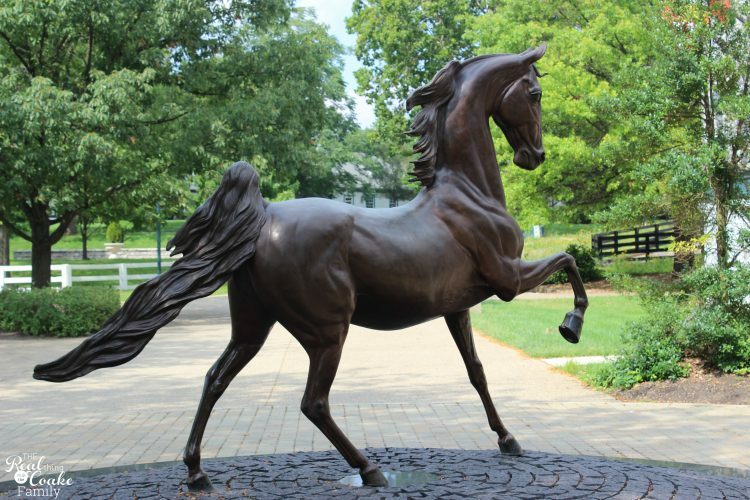 There are tons of statues around the grounds. Unfortunately, because we got there so late in the day, most things were already shutting down for the day. 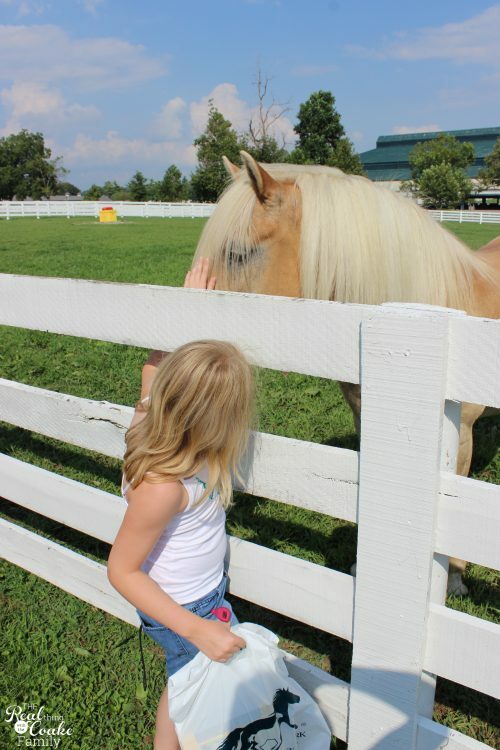 This horse seemed to know that Pumpkin needed a little bit of horse therapy for the day. Despite the fact that she couldn't see some of the things that she really wanted to see, Pumpkin still says she is really glad we went. 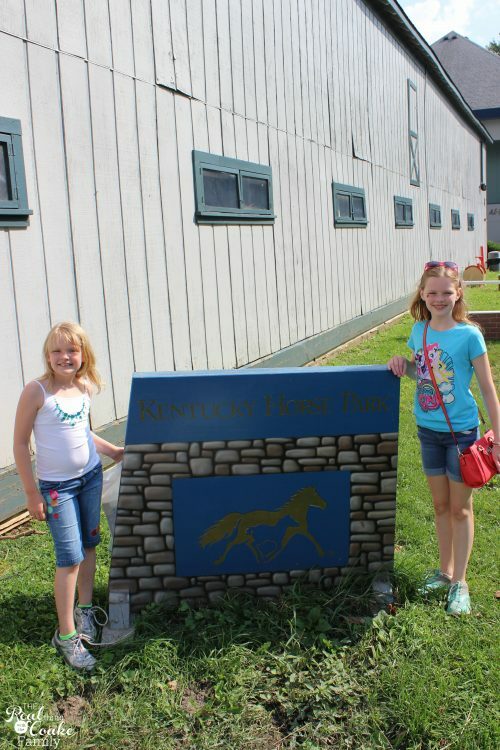 They have some of the jumps that have been used in former races. 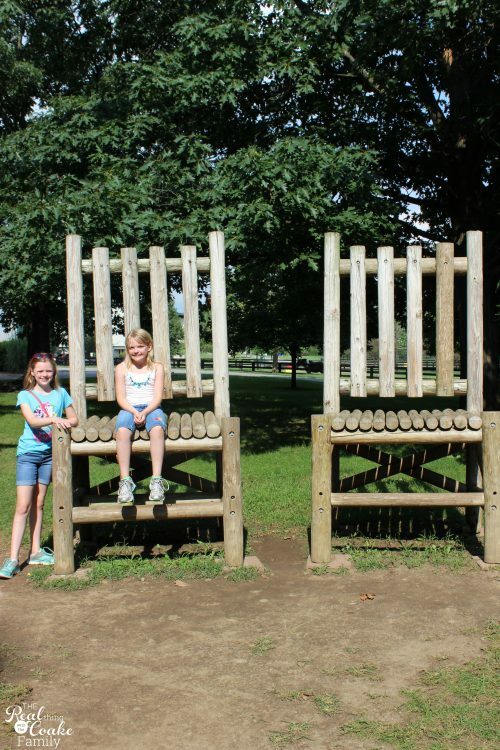 These pair of chairs were used in a competition. Pretty amazing how large they are. Just some prettiness from the park. 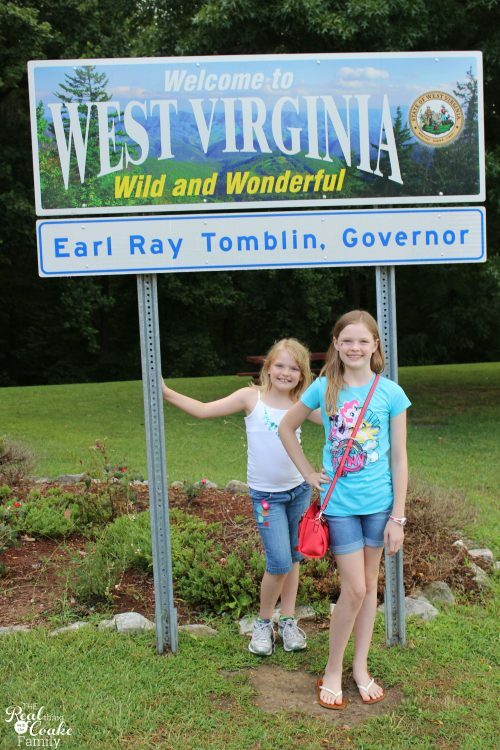 Our goal for this day was to make it to West Virginia. We made it. 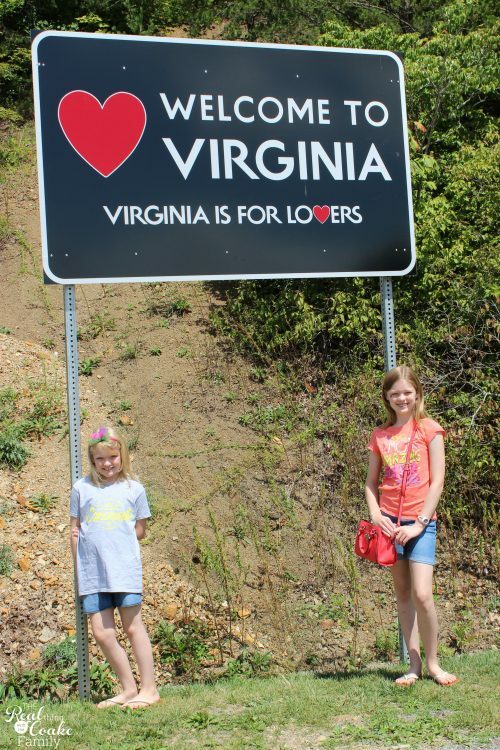 We thought this was the only sign welcoming us to West Virginia. We snapped our pics and went to the bathroom. When we came out of the bathroom, we found this actual welcome sign. More pics! 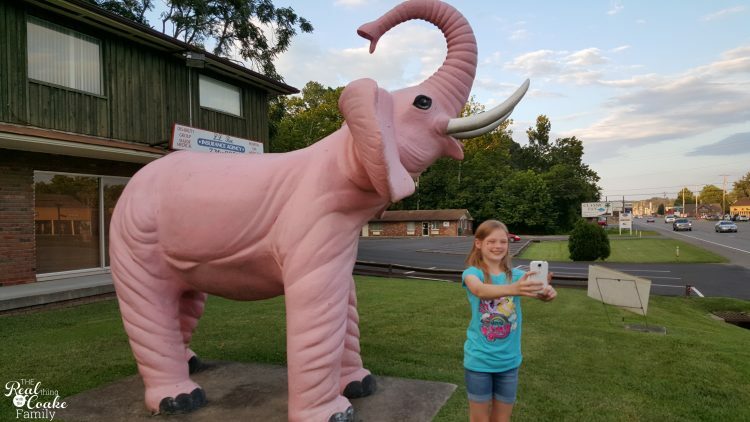 If you have read or looked at, all the posts about our trip, you may remember that we found a pink elephant in Wisconsin. 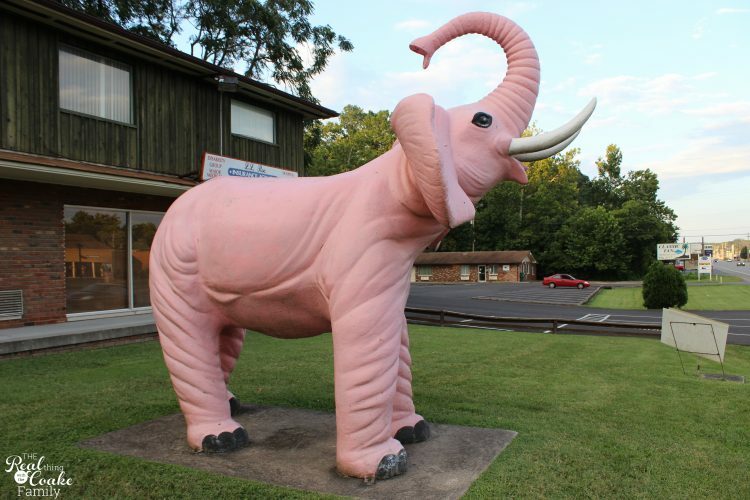 We found another pink elephant in West Virginia(it has its own facebook page…really?). This one hasn't been as well cared for and is a lot smaller than the other. It still made for a good quick stop on the trip. 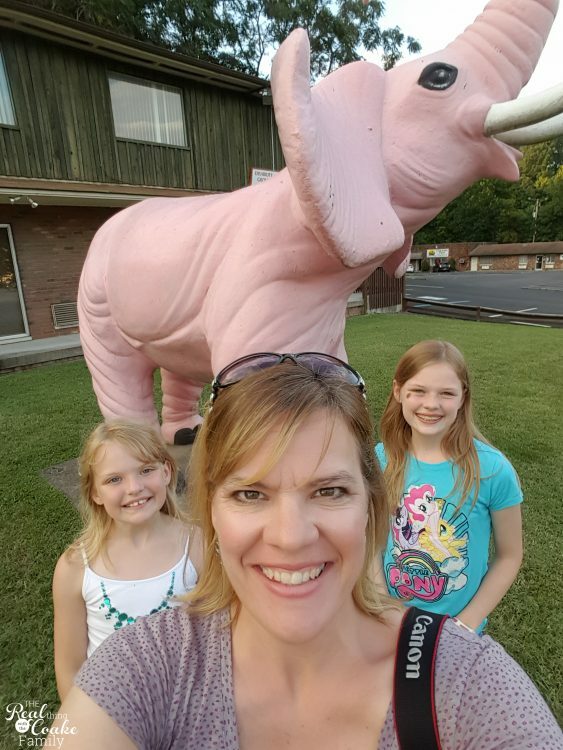 We love our pink elephants! The following day, we made it to our current home state. I was really sad…though glad to be nearing the end of our journey. I still would have turned around and gone back to what my heart calls home, Portland, at any moment had someone twisted my arm. Our last day on the road, we decided to drive a little bit of the Blue Ridge Parkway. We were all hoping for a repeat of the fun and gorgeous view we had seen on Beartooth Highway (I always type Bluetooth Highway when I write that. LOL!). While the Blue Ridge Parkway is pretty, it wasn't anything compared to having just driven the Beartooth Highway. So many of what could be gorgeous view are either so overgrown you can't see the actual view or there is no stopping point at which to get out and see the view or take pictures. This one falls under the we are glad we did it category, but it was totally disappointing. We stopped for lunch (which it was really dinner time but whatever…it was lunch for us) and found a Duck Donuts. If you have ever been to the Outer Banks of North Carolina, then I'm going to guess you have had Duck Donuts. They are fresh made and so stinkin' delicious. They are also starting to pop up all over Virginia. We picked this as our final road trip treat. In the final miles of our journey. It almost seems like we may be wearing the same exact things we were wearing when I snapped a screaming shot on day 2. Sad to be almost done with our adventure, but so ready to be home and not on the road. 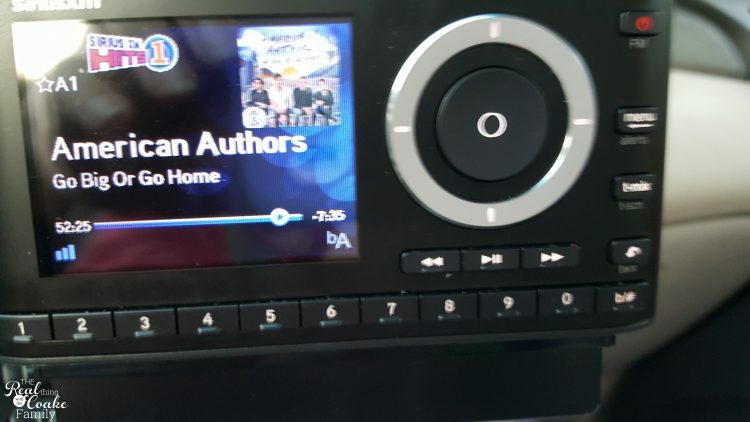 We picked this as the theme song for our road trip this summer. 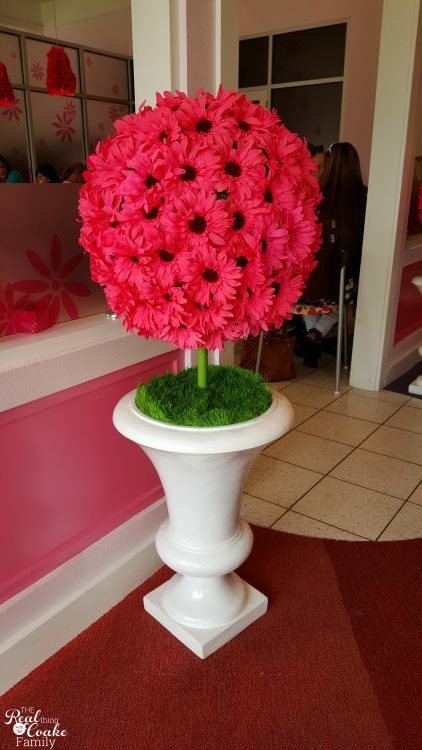 Yep, we totally went big and then went home. In all, I drove more than 7,000 miles. 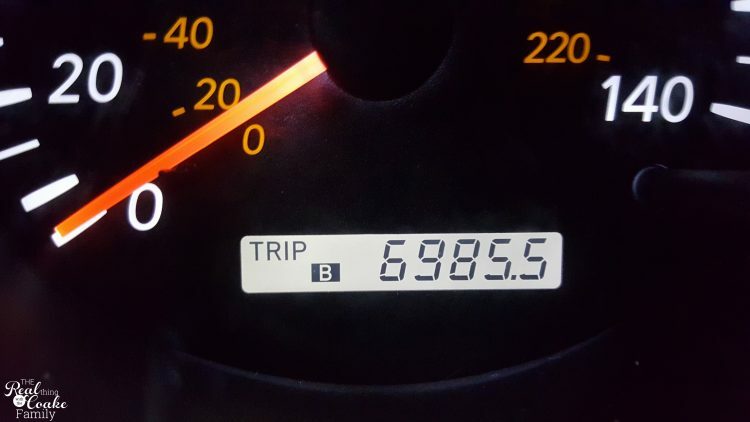 On our first day, I forgot to set the odometer until we were somewhere over 100 miles into our trip. Impressive. I drove every single one of those miles this summer. And we are finally reunited with our dog and our cat and our hamster and our fish…well pretty much our zoo. Yay! My 2015 road trip mug collection. Filled with tea and good memories daily. ☺??☕? These are all of the mugs I collected on our journey this summer. I could have snagged a couple more in California and had I been able to find the new Oregon or Washington, I would have grabbed those. I love those that I got, so I'm good and I really don't NEED more mugs…even though I love them. I really need to DIY something to display/store them because they are still sitting on my kitchen counter. I can't fit them all into my kitchen cabinet. These are all of the mugs I have collected between our road trip last summer, this summer and a little bit of other travel. Like I said, I really need to figure something out for the storage. I have a few ideas…so hopefully I will figure something out and show you soon. 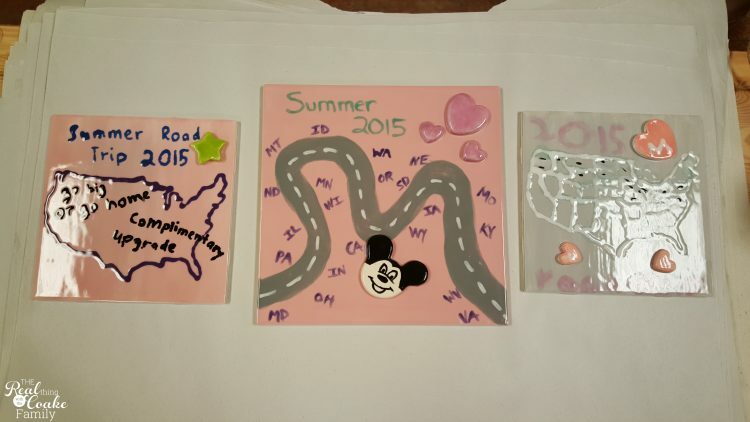 Last summer, we made some tiles while we were on our road trip. This year, we made tiles a few days after we got home. We went to a local studio that we are friends with the owner. She has the best staff who are super creative. They totally helped us with templates and ideas. I Love what we came up with. I have plans for these tiles along with some frames and pictures and a map in our front hallway. I'm hoping to get to some of it this year, but I have Pumpkin's room makeover that has been promised, so that will probably come first. I'll show you as I get things pulled together. I promise. I think it is going to be great! Well, that is the end of this years road trip. My girls have already planned our trip for next year. I guess they like our trips and spending weeks on the road with mom. I'm game if they are! I love our summer road trips and all the time I get with them and all the things we get to see and do. Hi KC, it looks like you all had a great time. I’ve always wanted to travel across the country but never have had the chance. I’ve been craving a vacation and everything about this post makes me want to get in the car and go…right now!! Your mug collection is awesome by the way!